I'm not inclined to dilute enigma. 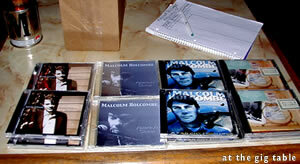 The poetry and the passion of Malcolm Holcombe are better beheld than described. His songs seem to use the same language that the songs of other songwriters do, but they nonetheless go together quite differently more often than not. In performance, he usually starts out pretty low key, but there's a volatility that bubbles up and starts to run out of his eyes and his hands and his mouth, as his energy starts to inhabit the room. He can't stay sitting for too long, and he'll just jump out of the chair and start stalkin between verses. And without sitting back down, he's likely to just bend down and bellow into the microphone where it was set before he got up. He handles his guitar more and more roughly as the show moves along, although the precision in his fingerstyle does not diminish. It simply seems like he's gonna pop a few strings or pull the spruce top off his Martin, but I've never seem him do either. It's like a controlled rage. And the rage, the intensity, may be just part of how he throws down, because he seems like a happy man these days. He and his wife Cynthia and her son live in Asheville, NC (where Chuck Brodsky, our other male interview subject this month, also lives). And when he talks about his family, or supper time, or sings the lullaby he wrote for his stepson, "Sleepy Town," I see a look of satisfaction cross his face that I'd not seen in the last handful of years catching his shows. His main henchman when he does Nashville gigs is the great Jelly Roll Johnson on harp, whom we hope to review next issue. But Jelly Roll was gigging elsewhere when I heard Malcolm recently at Douglas Corner (where Malcolm worked in the back when first he came to town) and he carried the show himself for over two hours. He would talk to the crowd some, and the difference between normal folk patter and Malcolm's kinda stream of consciousness conversation would keep one cognizant of the fact that this is not your average folksinger, no sir. He busted a few moves of this nature in the conversation to follow, which I always find interesting. It's like a jam, where anything is liable to pop out. There are several CDs represented in the clips on the Listen page, check them out. Two of the records are produced by Don Tolle, Another Wisdom and A Far Cry From Here. The album recorded for Geffen, A Hundred Lies, shelved and then recovered by powerful friends, is also available for your pleasure. As I mentioned in our recent review of Another Wisdom, it does this fan's heart good to see Malcolm doing so well, because we need him around. What he's doing is not only great, it's original, when so many are doing hopelessly xeroxed versions of the same thing. 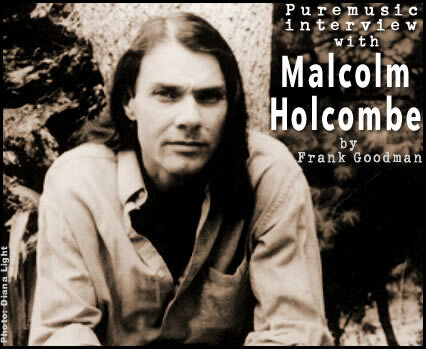 And now our conversation on the phone one recent evening, with Malcolm at his home in Asheville.